The Texas economy advanced in November. Total employment expanded 1.8 percent year-over-year with a monthly gain of 20,900 jobs. Monthly job losses came directly and indirectly from the decline in the energy sector, but a trough seems to have been reached as the sector rebounded with stabilized oil prices, increased rig operation, and a narrowing in job losses. Overall employment gained momentum and currently exceeds the U.S. rate of growth. Housing sales increased statewide almost 20 percent from the year prior primarily due to a low base in November 2015. Months of inventory and days on the market remain relatively low. Total building permits increased over the month and year. The coincident and leading indexes suggest a slowdown in residential construction. With interest rates expected to rise in 2017, sales in the short-term may pull back, but home prices are expected to keep increasing. 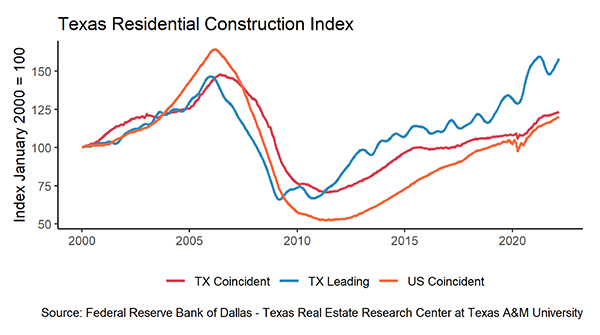 The Texas Residential Construction Leading Index (RCLI), which signals future directional changes in the residential construction business cycle of single and multifamily housing, declined in November. The RCLI was negatively affected by a monthly decline in housing starts. The Texas Residential Business Cycle (Coincident) Index, the measure of current construction activity, also declined as inflation-adjusted residential construction values continued a slide begun in May 2016. The RCLI indicates slow growth in future residential construction while the coincident index registered a slowdown in current activity. Housing starts decreased 11.3 percent seasonally adjusted year-over-year continuing a negative trend that started in late-summer 2016. Single-family housing construction permits statewide increased during November both on an annual and monthly basis; the overall trend since late-2014/early-2015 remains positive. Austin continued to grow at an accelerated rate after reaching a mid-2015 trough. Dallas had been flat-to-declining during the year but showed signs of improving at the end of 2016; year-to-date numbers are ahead of last years by 5.0 percent. Houston also showed signs of recovery toward the end of the year, although the year-to-date change was a negative 3.7 percent over the same period in 2015. Fort Worth and San Antonio trended positive as the year progressed, but San Antonio remained 2.4 percent behind year-to-date numbers over the same period during 2015. Fort Worth remained more-or-less unchanged. Houston (2,648) and Dallas-Fort Worth (2,123) still led the nation in the number of single-family permits issued, followed by Atlanta (1,629) and Phoenix (1,355). Months of Inventory of Texas houses for sale remained low at 3.7 months (seasonally adjusted), indicating continued strong housing demand and short supply. The nation rested at 4.3 months (around 6.5 months of inventory is considered a balanced housing market). Overall, supply has been restricted due to limited lot inventory and construction labor shortages. 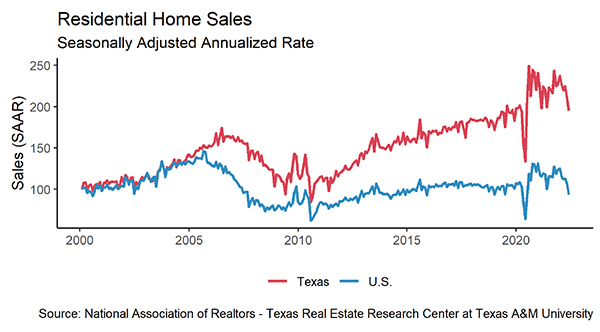 In November, total Texas housing sales spiked 19.9 percent year-over-year seasonally adjusted (+19.5 percent not seasonally adjusted) compared to 18.3 percent in the nation (+17.8 percent not seasonally adjusted). All of the major metros had sales increases similar to the state—Austin (17.3 percent), Dallas (19.5 percent), Fort Worth (20.9 percent), Houston (22.5 percent), and San Antonio (22.8 percent). Home sales percentage increase was dramatic primarily because November 2015 experienced a relatively low month giving way to a large year-over-year boost for November 2016. A possible second explanation is homebuyers attempt to close ahead of an expected December rate hikes pulling sales forward from later months. Year-to-date sales for Texas were 4.6 percent over the same period in 2015 compared with 4.8 percent for the U.S. further indicating the November percentage increase was an aberration, not a new trend indicator. Mortgage interest rates rose during the month. The Federal Home Loan Mortgage Corporation ticked up 30 basis points to a 3.77 percent average rate on a 30-year fixed-rate mortgage, while the ten-year U.S. Treasury bond yield edged up to 2.14 percent from 1.76 the month prior ahead of a potential fed funds rate increase during December and higher inflation expectations into the foreseeable future. The number of days an existing home was on the market in November remained low at 52 days relative to prior periods reflecting the tight supply and continued strong demand. During the same month, new homes registered longer sales periods than existing homes at 90 days. Existing home days-on-market for the Texas Triangle metros remained low relative to past periods, ranging from 32 days for Dallas to 56 days for San Antonio. In number of days, Austin (96) and Houston (97) new homes took longer to sell compared to San Antonio (80), Dallas (80), and Fort Worth (78). Overall, sales prices have risen steadily in Texas since late 2011. Existing home prices were stable and increased through November in the state and its major metros. 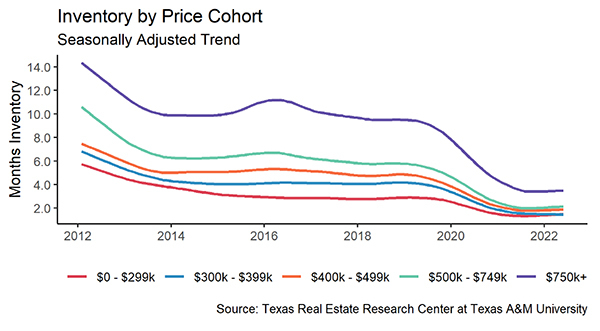 New home prices in the state were stagnant due in part to the energy decline; Austin and Dallas continued their upward climb while Fort Worth, Houston and San Antonio remained suppressed. New homes prices in Dallas and Houston are on par with and have exceeded Austin's new home prices. Austin was the house price appreciation leader through November 2016 with existing home prices remaining well above the other major metros. Nonenergy employment growth and a strong services sector caused Dallas-Fort Worth to also register strong price appreciation. 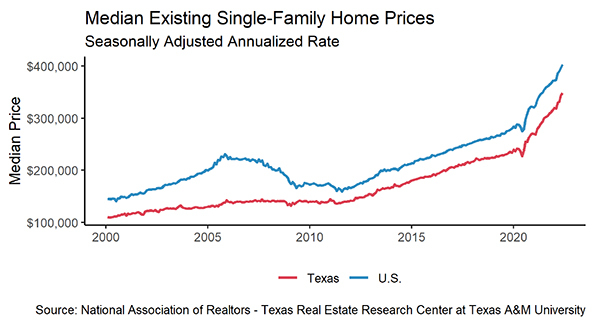 Existing home prices in Houston appear to have recovered following the energy sector decline while new home prices are still lagging. However, new home prices on a per-square-foot basis show more positive trends. This suggests that demand was stronger in the lower- and mid-priced segments and price cuts have been taken in the higher-priced inventory. Austin exceeds all other metro's new homes in terms of price per square foot. The difference between the initial listing price to the actual sales price for new homes fell at the start of 2014 and has now flattened as the demand for new homes eased. This decline drove down the gap between new home and existing home sales-to-price ratio and are now similar, as the listing-to-sale price difference for existing home has also leveled out. Since 2011, new home prices have exceeded existing home prices by 47 percent and 37 percent based on median and average sales prices, respectively. This price differential results primarily because of increases in home size for newer homes and the significant increases in construction and land costs for new homes. The average price per square foot for a new home in Texas is approximately 19 percent more than for an existing home. Housing affordability in the Texas Triangle metros gained momentum in the third quarter. The Housing Opportunity Index for Austin and Dallas—measuring the percent of homes affordable to those earning the median family income for the area—are found to be below the national value. They are relatively less affordable than the rest of the country as a result of rapid price appreciation in recent years. In contrast, Fort Worth is found to be relatively more affordable than the nation, while San Antonio seems to register relatively the same affordability as the U.S. Lower prices in Houston also resulted in an increase of affordability. Article Source "Real Estate Center at Texas A&M University" you may also read the report here.